A'Rosa Cruises was a brand marketed by Seetours of Germany. It was also part of P&O Cruises, and thus in turn part of Carnival Corporation. Formed in 2002, A'Rosa Cruises aimed at the German cruise market. In the original plan, the two sisters Crown Princess <I> and Regal Princess <I> of Princess Cruises would be transferred to the fleet, but only the former really did. 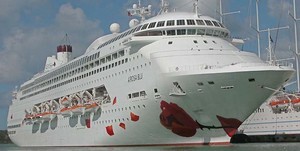 The cruise line only had two years of history, as it was merged into AIDA Kreuzfahrten in 2004 and A'Rosa Blu became AIDAblu. The atmosphere onboard A'Rosa Cruises was similar to that of AIDA Kreuzfahrten, where informality of cruising was offered.